Soldier of Fortune Gelding won the Grade 3 Fishery Lane hurdle by 2 lengths at Naas over 2m in soft to heavy in November beating Meri Devi who has since won the Listed Quevega hurdle. He was then stepped up in Grade when contesting the Grade 1 Royal Bond Novice Hurdle where he was 2nd beaten 5 ½ lengths over 2m in soft ground. His only run in 2018 came after a 63-day break when he finished 9th, 21 lengths behind Samcro in the Grade 1 Delottie hurdle. Stowaway Gelding won his Maiden hurdle by 3 lengths at Cork back in November 2017 over 2m in soft to heavy ground beating 22 other rivals that day. He then went on to win his novice hurdle in mid-December by ½ length in heavy ground over 2 miles at Punchestown. He was then stepped up in grade when finishing 2 ½ lengths 2nd in the Grade 3 Irish Independent hurdle, he hasn’t been seen out yet in 2018. He can cope with big fields as judged by his novice hurdle win. Voix Du Nord Gelding was 6th on his only start for G. Chevel in France at Compiegne over 2m 3f in a chase in heavy ground in March 2017 he had a 287 day break was then sent to joseph where he ran for the first time for the stable at the end of December where he finished a promising 5th beaten 13 ½ lengths behind the winner at Leopardstown in a 3mile ½ f handicap chase on yielding ground. He was dropped back in trip for his only run of 2018 when he finished 9 lengths 2nd at Leopardstown again over 2m 5f in a h’cap chase, He has only ever run on ground with cut in the description. He is a lively outsider in which ever race the team decides to go for. Also entered in the Brown Advisory & Merriebelle Stable Plate Handicap Chase (Grade 3) over 2m 4f where he is 16/1 with Betfair and the Johnny Henderson Grand Annual Challenge Cup Handicap Chase (Grade 3) 2m½f where he is 40/1 with Betfair. High Chaparral Gelding has improved with each of his runs over hurdles. He was 10th of 16 on his hurdles debut in a Maiden hurdle at Down Royal beaten 63 lengths in the soft over 2m. He had a break of 54 days. He was then stepped up in trip for his next run where he finished a 1 ¼ length 4th over 2m 4f at Leopardstown in the soft in a Maiden hurdle back in December. 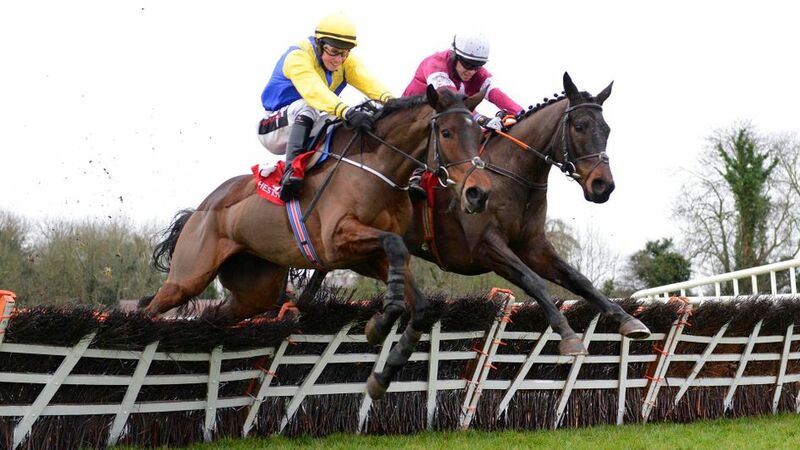 His only run of 2018 was his best run yet over hurdles, he was thrown in the deep end in the Grade 1 Nathaniel Lacy & Partners solicitors novice hurdle at Leopardstown this time over 2m 6f which he won by a head proving he had what it takes to put it up to the best of them. I think he will go for the 3 miler as he proved he can stay. Will put in a big run. Currently 25/1 with 888 Sport. Oscar Gelding is unexposed over hurdles having only ran 3 times in that sphere. He was 5th beaten 13½ lengths on his hurdles debut at Down Royal in a Maiden hurdle over 2m 4f in yielding ground. He had a break of 122 days and made his 2018 debut in a 2m 4f Maiden hurdle at Fairyhouse in heavy ground where he finished 3rd of 15. He had another break of 51 days before he returned to the track at Punchestown over 2m 4 in soft to heavy ground in a Maiden hurdle where he finished a 22 length 5th of 9. He could be anything. Dubai Destination Gelding was 2nd at the end of October in a novice hurdle at Galway beaten 2 ¾ lengths over 2m 4 ½ f in soft to heavy ground. He was then a 3 length second at Cheltenham in November over the old course over 2m 5f in soft ground, he made rapid progress from the rear that day to challenge the winner coming to the last where he made a mistake and wasn’t able to get back into it. He was last seen out at the end of December where he ran disappointingly finishing 10th at Leopardstown over 2m 4f in the soft. I am awaiting his 2018 debut with interest; his Cheltenham course experience should stand him in good stead. Also entered in the Randox Health County Handicap Hurdle (Grade 3) currently 40/1 with Coral and the Martin Pipe Conditional Jockeys' Handicap Hurdle currently 50/1 with Boylesports. This Grey daughter of Mastercraftsman finished 4th in the Grade 2 Knight Frank Juv. Hurdle back in December 2017. She was beaten over 7 ½ lengths over 2m in yielding ground at Leopardstown. Her next outing saw here at Lingfield on the all weather for her 2018 debut in a stayers h’cap where she finished 3 lengths 2nd on that occasion. She returned to hurdles for her last start in the Grade 1 tattersalls Ireland Spring Juv. Hurdle at Leopardstown over 2m in the soft, thus gaining her all important black type. The Fred Winter is a drop down in grade for her. Currently 33/1 with Paddy Power. 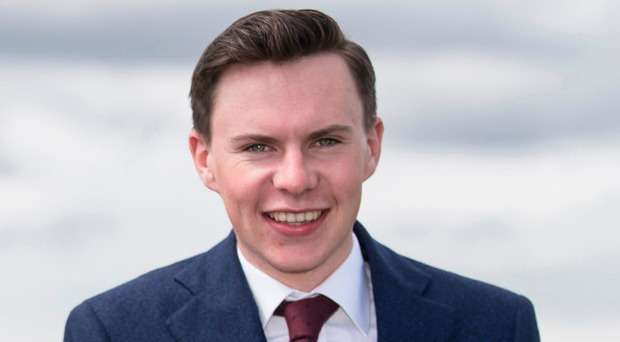 Montjeu Gelding has only had 3 runs in his life, he was 2nd on his debut beaten 1 ½ lengths at Punchestown in November 2017 over 2 miles on soft to heavy ground. His next run was at Thurles in December over 2 miles in heavy ground where he readily accounted for his other 9 rivals by an impressive 19 lengths. He was stepped up in class for his first run of 2018 when he contested the Grade 2 Goffs future stars (C & G) I.N.H. flat race he finished 2nd that day 1 ½ lengths behind the winner and current Champion bumper favourite Blackbow. Reputed that he will be a better horse on decent ground. Has an excellent chance of giving Joseph his first Cheltenham festival winner in his own right as a trainer as he wasn’t on the trainer’s licence when Ivanovich Gorbatov won the Grade 1 JCB Triumph Hurdle in 2016. Montjeu Gelding finished 20th and last at Fairyhouse in December over 2 miles in soft ground in a h’cap hurdle he was always in the rear that day. He was then seen out again at the end of December when he improved significantly to finish 7th beaten 29 lengths by the winner in a 2m 4f hurdle race at Punchestown. His one and only start in 2018 saw him finishing a well beaten 21 of 28 over 2m at Leopardstown in the soft. His record at Cheltenham reads 1-6-12. His best effort was winning the JCB Triumph hurdle back in 2016, he was 6th last year in this race saves his best form for the new course. A good each way chance. Montjeu Gelding’s form has been in and out since he won the Galway hurdle back in August 2017. He finished 11th beaten 16 lengths in a H’cap hurdle at the beginning of December over 2m in the soft at Fairyhouse. He was stepped up in trip on his next run to 2m 4f at the end of December at Punchestown but was beaten 27 lengths into 6th place over hurdles. His only run of 2018 saw him finish 19th of 28 over 2m at Leopardstown in the soft. He has run at Cheltenham before back in November 2017 over the old course where he finished 9th, he is a horse used to the hurly burly of a big field. This 5-year-old son of Network has been running in Grade 1 company on his last 3 runs. He was 6th in the first of them the Bar One Racing Royal Bond Novice hurdle over 2m at Fairyhouse in the soft at the beginning of December. 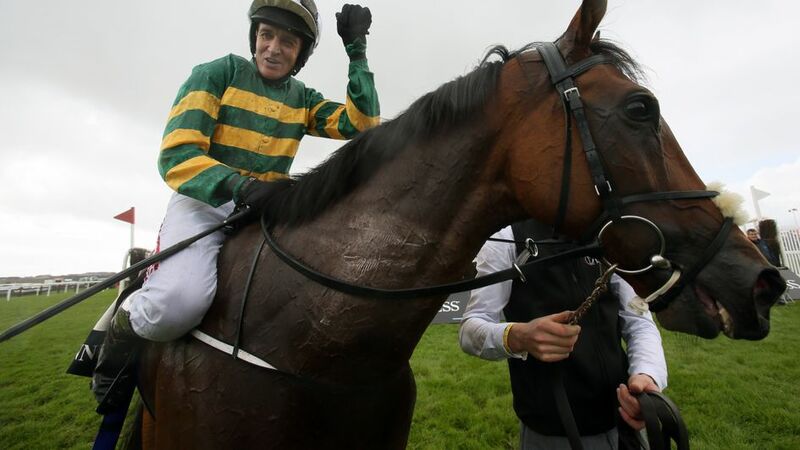 He was seen out again a few weeks later at Leopardstown over 2m in soft ground in the Paddy Power Future Champions Novice hurdle where he was beaten 19 lengths into 2nd. His only start so far of 2018 saw him up against festival banker Samcro over 2m at Leopardstown again in the Delottie Novice hurdle where he finished 20 lengths behind Samcro in 8th. This race sees him drop down in grade but he’s up against seasoned handicappers on his handicap debut. Kayf Tara Gelding had a traumatic time the last time he ran at Cheltenham where he was pulled up in the 4m JT McNamara chase in good to soft after running a mighty race. Who knows how close he would have gone if he hadn’t gone wrong on the run up the hill, He had put in some great jumps that day. After a 289-day break to recuperate he ran again in the Grade 1 Leopardstown Christmas Chase over 3m in yielding ground where he was again pulled up, I’m sure ring rustiness played its part. His only start of 2018 was the biggest run of his life when he won the Grade 1 Unibet Irish Gold Cup at Leopardstown over 3m by a neck. Some say Killultagh Vic would have won if he stood up. I say “Wulfy” my nickname for the horse would have given him a close run and probably still won. I don’t believe he is a forlorn hope in the Gold Cup providing he doesn’t remember the horrors of the last time he was here only time will tell. ---------------------------------------------------------------------------------------------------------------------------------------------------------------------------------------------------------------------------------------------------------------My wish is for all the jockeys and all the horses to come back safe and sound especially Edwulf. My selections would be Vieux Morvan, Rhinestone, Tower Bridge and Edwulf.